Ride it and love it or return it within 30 days! If you don't love your board, we will take it back no questions asked! 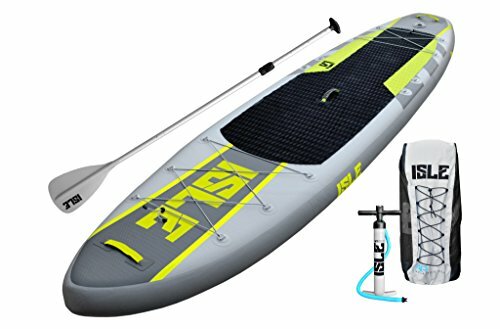 The ISLE Airtech® 11' Explorer Fusion-Lite Inflatable Paddle Boards is designed for those who seek adventure on the water. Equipped with 14 individual D-Rings, Durable Nose and Tail Carry Handles and Bungee Systems, giving you plenty of room to stash all your gear for those long-haul paddles and the capability to attach a cooler. Dimensions: 11' x 32" x 6"
Paddle Adjustable: 65" to 86"
AIRTECH CONSTRUCTION - 11' x 32" x 6" | Board Weight: 19.1 Lbs. | Supports Riders up to 275 lbs. If you have any questions about this product by ISLE Surf and SUP, contact us by completing and submitting the form below. If you are looking for a specif part number, please include it with your message.